The hotel’s two internal courtyards provide a green oasis in Budapest’s city centre. Guests can spend pleasant summer evenings sitting on benches in the garden, looking up at the starry sky and listening to music that fits the mood. The internal courtyard can be turned into an atmospheric terrace to the restaurant in the summer, and is also a suitable location for cocktail parties. Events catering is a separate category among the extensive range of services offered at the Continental Hotel Budapest****Superior. Our special locations such as the Roof Garden, the Conference Courtyard and the Restaurant with Terrace can be used for many types of event thanks to their unique construction and gardening solutions. 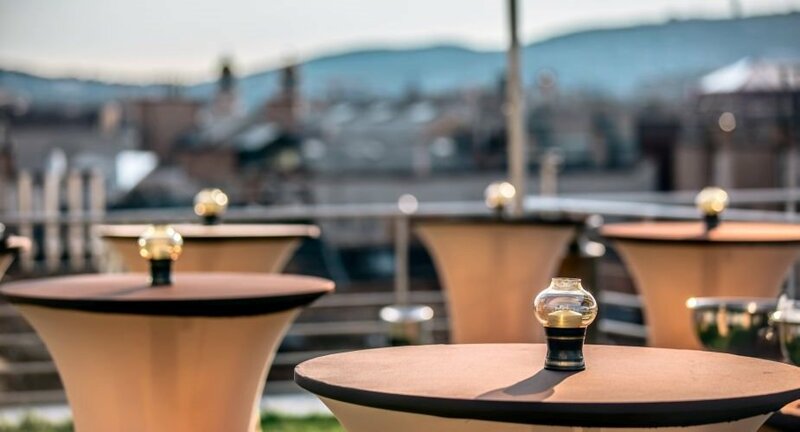 One of the largest wellness and fitness areas among Budapest city centre hotels is located in the building’s roof garden, which provides guests with a real oasis in the bustle of the city centre. The roof garden and the two internal gardens can be special locations for cocktail parties, standing receptions and other unique events. Our Conference Courtyard and Restaurant with Terrace are extremely suitable for accompanying events for fewer than 50 people.